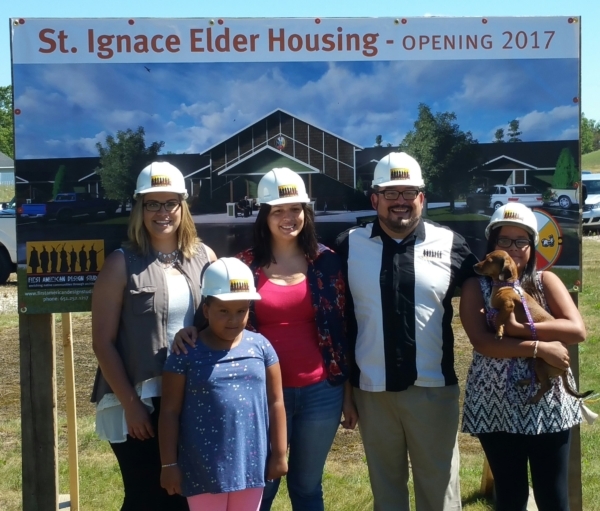 Today, we gathered and did a ‘ground blessing’ for the St. Ignace Elderly Housing project for the Sault Tribal Housing Authority. It was an absolutely beautiful day, with prayers and honor songs to bless our site. You may notice the absence of shovels. Talking with our client, we think it is appropriate to do a blessing in lieu of the non-Native approach of a ground breaking, which seems disrespectful to start off a project by scarring the earth. The new 20 unit elderly facility has two bedroom units, each with a patio. The facility also has a place for elders to gather outside of their homes, including a community kitchen for elder meals. The exterior site has sacred gardens and community gardens with individual elevated garden plots for each elder. It was an honor to be a part of this project and we look forward to its completion in 2017.